The classic Solitaire game that was pre-installed on most Windows operation system. Now you can play it online. So enjoy and have fun in playing Classic Solitaire Game. 1. Before starting the game you have the option of drawing 1 or 3 solitaire cards. Three will make the game more challenging. 2. Click and drag a solitaire card onto any card of an opposite suite and color with 1 greater value (i.e. : from an eight to a nine). 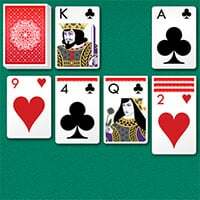 In Classic Solitaire Game, aces considered the lowest value cards, while Kings are the highest. 3. Click on a face-down solitaire card to flip it face up and see its value. 4. Drag or double click Aces to add them to of the four “card foundations” that can be found in the upper right corner of Classic Solitaire game. 5. Click on the deck in the upper left corner to draw cards. 6. You can drag Kings to empty card stacks. In Classic Solitaire Game: The goal is to fill the four foundation stacks with cards separated by suit and arranged in order of value, from lowest to highest (Ace, 2, 3, 4, 5, 6, 7, 8, 9, 10, Jack, Queen, King). So can you be the Solitaire king and win this Classic Solitaire? Also make sure to check out Solitaire Legend Game, you may enjoy playing it.